Well first of all, great site! I have already printed off good plywood repair info from here. 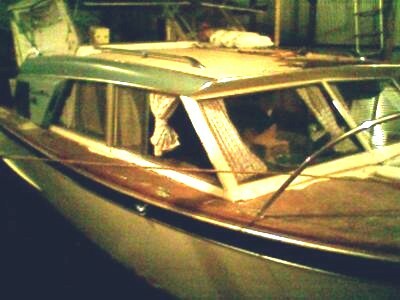 I aquired this 26' plywood cabin cruiser, by repurchasing an old family boathouse. She has been in the water for 20 years, in a floating boathouse on the Tennessee River, Huntsville, Alabama. One of the last ones in North Alabama still floating. I have done a lot of reading and asking, as knowledge of wood boats seems to be gone from this area. I am asssembling a 'how to' reference manual. I dove the hull, only finding small rot at the lower edges of the transom. Exterior plywood. On the side and stern pieces. So I will have to learn how to repair that area. I think it is 1/2" hardwood plywood. A couple of foredeck water soaked spots, I believe I can fill in with some type of wood based epoxy?? And one area that is cracked through near the cabin window. The cabin area is mint, cushions shot though. Drivetrain has 592 original hours, a 283. Motor is not stuck, I did the right methods before turning over. I can't find a reasonable trailor for this 26' inboard boat. Thought of trying to build some type of yard dolly to pull it with, any suggestions? I bought a custom trailer for a 26' chris craft, used, from a man with an identical boat as mine. A tree limb fell on his boat. So now I have a nice dual axle single inboard, redundant adjustable bunks trailer. we have complete non water worthy boat and trailer. Call me if you need any parts trailer etc..
Just found this site, and wanted to shout out! I didn't see a date on the thread and wondered if you are still at it or finished or moved on. I may have the V-berth cushions you need and I'm in Atlanta, not so far from Huntsville. I'm parting out a 1966 Cavalier 25' and have lot's of goodies for a DIY boater. A Gem of a "Cavalier"
I love the color scheme, really elegant. And it is great that she is still afloat. But that does mean that your first job will be to get her out of the water and onto dry land, where you can work on her. Do you have a slipway where she can be pulled out on a trailer? If not you might have to think about hiring a crane. Thank you for the complement on my website, the information is however fairly general as my intention was to encourage and inspire others to restore and build Wooden Boats of all and any type. Your Chris Craft Cavalier is a gem, she is worth restoring properly, so it might be worth your while checking out a more specialised website such as the Chris-Craft Antique Boat Club. However, please do come back and ask any questions and let us know how you are progressing. And if you need any encouragement have a look at some of the other projects such as the work Bill has done on his 26' Andress. If you want to add any more photos you can email them as attachments to me at mike@diy-wood-boat.com we would love to see them.